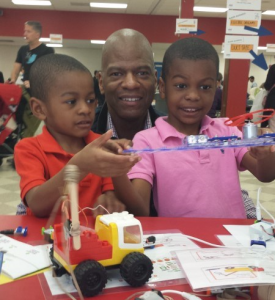 The Achieve Foundation promotes access to experience-based STEAM (Science, Technology, Engineering, the Arts and Math) education for all students at all grade levels – including makerspaces, robotics, computer programming, CAD design, technology, bioinformatics and more. STEAM education combines art and creativity with new technology in all subject areas. Mark your calendars for the 5th annual Maker Madness fair! Maker Madness is just one way that Achieve brings STEAM education to the community. This free, hands-on educational event for students and their families offers an interactive, museum-like experience that is equal parts demonstration (teaching) and experimentation (creation and play). The all-day event targets school-age children, especially those who do not have broad access to technology in their homes, or all who want to try their hands at designing, creating and building projects under the tutelage of STEAM experts from the school district and community. 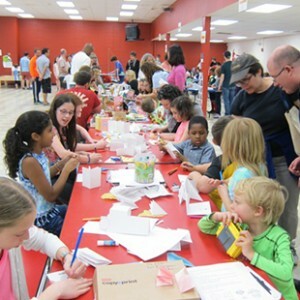 Held at Columbia High School, Maker Madness offers activity stations such as animation, 3-D printing, electronics demolition, kinetic sculpture, catapults, coding, popsicle stick bridges, pop-up books, origami and more! Hosted by Achieve at the end of April since 2015, the event is planned and carried out by more than 100 volunteers. If you can help oversee a maker station, sell concessions or do one of the many volunteer jobs needed that day, please sign up here. 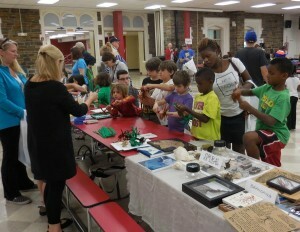 More than 1,200 students and adults participate every year. Thank you to our 2018 Sponsors! Watch the 2018 Maker Madness Video!